The election on Tuesday will end the contentious race to recall four members of the school board spurred by a transgender policy passed by the board. The race- which seeks to recall Sarah Belanger, Christopher Lewis, Nancy Deal and Greg Talberg, has galvanized the community but could result in higher voter turnout to the polls as a result. Michelle Eichler, who has worked to get the current school board re-elected, said she was somewhat cynical about the sustainability of voter engagement after the midterm election. “They need to get out and vote, if they don’t vote things will change, and I don’t see them changing for the better,” Eichler said. Eichler said that some people might not be engaged on either side of the school board debate enough to get out to the polls and vote for members of the school board. “Most of the community, this is a whatever button,” Eichler said. However, the city always anticipates a 100 percent turnout when stocking ballots for any election, says Williamston City Clerk Holly Thompson. 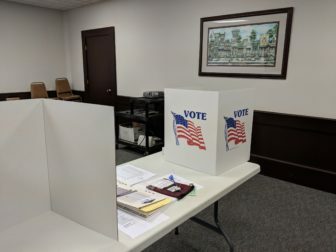 The city has been working hard to get the word out about absentee voting, either through ads in the paper or letting people know through the city’s social media pages, Thompson said. “We’ve been really trying to push, I think it’s been working,” Thompson said. Deputy Clerk Barb Burke anticipates a good voter turnout on Tuesday based on the number of absentee ballots they’ve received. Thompson also expects a good voter turnout this election and says the city is prepared for it. She said that they expect more absentee ballots to come in and are having special Saturday hours to allow for people to come in and get their absentee voter ballot from 8 a.m until 2 p.m. Both precincts in Williamston City will be voting at the Williamston Middle School gym 3845 Vanneter Road on Nov. 6. The city just concluding a training session to help prepare the 14 election inspectors the city says it has this year to run the polling station at Williamston’s Middle School. 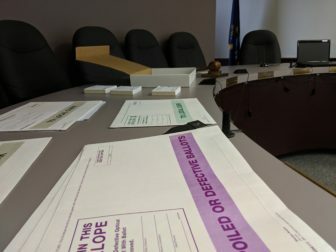 Thompson said she takes the extra time to do hands on training with the election inspectors to help familiarize them with the computer system and other equipment that they will need for election day to help things run smoothly. The Ingham County Board of Commissioners approved a new roads sub-committee connected to the county services committee.